Septic Systems, An Ounce of Prevention. Home / Lakewood Ranch Plumber / Septic Systems, An Ounce of Prevention. An ounce prevention is worth a ton of cure! Committing a little attention to the care of your system can help to avoid the nightmare of a failing system. Assuming that your septic system was properly located, designed and installed according to state codes, you are now in the driver’s seat for the care of your system. Conserve water to reduce the amount of wastewater that must be treated and disposed of by your system. Doing laundry over several days will put less stress on your system. Repair any leaking faucets or toilets. To detect toilet leaks, add several drops of food dye to the toilet tank and see if any dye ends up in the bowl. Divert down spouts and other surface water away from your tank and drainfield. Excessive water keeps the soil from adequately cleansing the wastewater. Have your septic tank inspected and pumped regularly by a licensed septic tank contractor. Suggested frequency is 3-5 years. Pumping your septic tank is probably the single most important thing you can do to protect your system. If the buildup of solids in the tank becomes too high and solids move to the drainfield, this could clog and strain the system to the point where a new drainfield is needed. Keep your septic tank cover accessible for inspections and pumpings. Install risers with lids if necessary. Call your county health department of a registered septic tank contractor or licensed plumbing contractor, whenever you experience problems with your system, or if there are signs of system failure. Keep a detailed record of repairs, inspections, and other maintenance activities. Pass these on to the next home owner. Don’t drive over your tank and drainfield or compact the soil in any way. Don’t dig around the tank or drainfield, or build anything over it, and don’t cover it with a hard surface such as concrete or asphalt. Don’t plant anything over or near the drainfield except grass. Roots from nearby trees and shrubs may clog and damage the drain lines. Don’t use a gargbage disposal all of the time. Limit its usage. Disposals increase solids loadings to your tank by about 50%, so you have topump your tank more often than normally suggested. Don’t use your toilet as a trash can or poison your system and the groundwater by pouring harmful chemicals and cleansers down the drain. Harsh chemicals can kill the bacteria that help purify your wastewater. Don’t waste money on septic tank additives. the bacteria needed to treat wastewater is naturally present in sewage. Additives can resuspend solids causing your drainfield to clog. Additives do not eliminate the need for routine pumping of your tank. Don’t allow backwash from home water softners to enter the septic system. Do not flush…coffee grounds, disposable diapers, sanitary napkins, cigarette butts, fats, grease, oil, paints, thinners, photographic solutions, antibiotics, dental floss, kitty litter, illegal drugs, tampons, condoms, paper towels, varnishes, waste oils, or pesticides. Never enter a septic tank — toxic gases from the tank can kill. 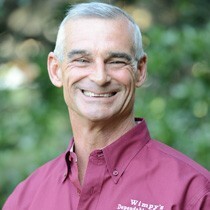 If your system develops problems, get advice from your county health department, licensed septic tank contractor or your local, Sarasota, State Certified Plumbing Contractor such as Wimpy’s Dependable Plumbing, Inc.